I was a pastor’s kid and a missionary kid. Us kids would often get gifts and presents from people we had never met and that always made me feel special. I still remember a necklace with a dove flying down on it (for peace) that I loved and wore for many years when I was a girl. To this day I don’t know who sent it to us in Taiwan all the way from the States. I always thought that when I got older I would do the same for my pastor’s kids. About 5 years ago, I started giving them gifts at Christmas time. These two drawing cases are for 2 of my pastor’s daughters. When it came time to monogram them with coordinating fabric like I’ve done in the past, I couldn’t find anything that would go with this blue toile. So I “embroidered” them, without at embroidery machine. You all may have figured this out WAY long ago, but it’s taken me until now to figure this out. So here’s a mini-tutorial on how I did it. Make an outline of the letter. Place the heavy-weight interfacing under the letter. This keeps the fabric from scrunching under the pull of the stitches. Using a zig zag stitch, sew over the lines to form the letter shape, stopping at corners and adjusting the fabric as necessary. My zigzag stitch width was 3.3mm with a length of .4 mm. I used a presser foot with an open toe so that I could see the lines more clearly. Ta-da! It takes more time and energy than an embroidery machine, but it sure is a lot cheaper. Iron adhesive to what will be the front of your wall pocket. You will later fuse your background fabric to the corkboard to keep the fabric from pulling off of the corkboard when you pull your thumbtacks out. 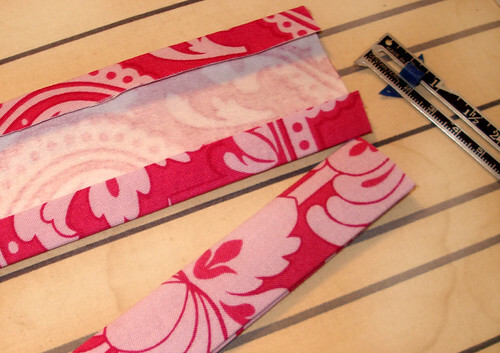 Fold the pocket piece in half so that it is 13 1/2″ wide and 6 1/2″ deep. Center the stabilizer inside the pocket, flush with the fold and pin into place. Edge stitch along the top of the pocket, securing the stabilizer as you stitch. Determine placement of 14″ ribbon and pin into place. Using coordinating thread, edgestitch along long edges of ribbon. 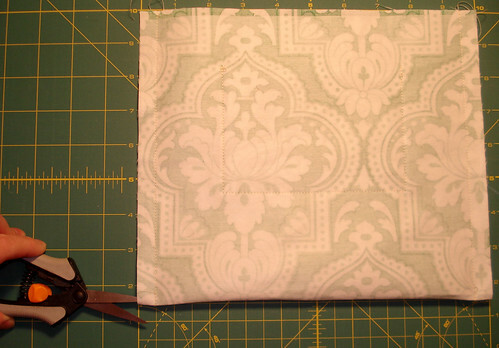 Lay the pocket on top of the background fabric, flush at the bottom and sides. Pin into place with pin head sticking out the side so you can see it when sewing later. Starting at the top right side, using a 1/2″ seam allowance, sew down the side, across the bottom, and up the other side. DO NOT SEW ACROSS THE TOP. Clip the bottom 2 corners. Turn pocket right side out, pushing out corners with a narrow tool. Slip the corkboard into the pocket, with adhesive facing up, making sure the side and bottom seams are behind the corkboard. Slip the cardboard behind the corkboard so that it is 11″ tall and 11 3/4 inches wide. Smooth the background fabric out with hands and fuse as much of the background fabric to the corkboard as you can reach with your iron. Trim the top of background and backing fabric so that it is flush with the top of the corkboard. Iron a 1/2″ crease toward the back on the bottom side of each strip of pocket fabric. Lay the strips on top of eachother, right sides together, raw edges up. Place both ends of the 24″ ribbon between the strips about 11-12 inches apart. The raw edges of the ribbon will be poking out along the raw edge of the strips. Turn ribbon 45-degrees, aiming the end of the ribbon out and pin into place. Using a 1/2″ seam allowance, sew along raw edge of strips, securing ribbon into the top binding. Place inside out on top of wall pocket, centering the ribbon along the top of the wall pocket. Mark with a pins the outside edges of the binding, keeping in mind that there is ~1/2 of thickness the binding will have to go around. Sew a line where the pin was placed. Turn right side out for a test fit. Adjust as necessary. Cut off extra fabric. Turn the binding right side out, pushing out corners. Place over top of wall pocket making sure the side seams are pushed to the back of the corkboard. This is where it gets fun. If your machine can sew through corkboard, then use the zipper foot. My machine has moveable needle position so I move it over to the left as far as possible. Lengthen the stitch length to about 3 mm or more. Use blending thread if using this method because the stitches are not always so pretty when sewing through this thickness. You will be sewing through corkboard, NOT cardboard AND corkboard. Use ~5/8″ seam allowance sewing close to the cardboard, but not so close that the binding puckers. Step 10: Email me so I can come see! I made my first wall pocket about a month ago. I am NOT an expert on wall-pocket making, but several people have asked me about the process of making them, so here I am – posting a tutorial like I’m some sort of expert or something! Ha ha. I guess there are 2 things that make this wall pocket unique and challenging: 1. It is a bulletin board on top and a pocket on the bottom; 2. It hangs from a ribbon. Take either of these things out, and the process is MUCH easier. Without a bulletin board, you could just fill the inside with 2 layers of cardboard and add more pockets. Take away the ribbon hanger so that it just leans against the wall, and the “closing up” process is much easier – no sewing through corkboard required! I love how there are so many ways to make variations on this idea: extra pockets for pens/pencils or notepad, decorative buttons, etc. I’ve thought that a leather hanger for a cowboy-themed pocket would be really fun as well. Enjoy the tutorial! Step 1: Fuse iron-on adhesive to 11×27″ fabric. Cut iron-on adhesive to cover 11×27″ fabric. Several pieces might be needed to cover the entire area. Follow manufacturer’s instructions to fuse. After fabric cools, peel off paper backing. Arrange charm pack squares with wrong side to fusible webbing on top of cover fabric. Fuse a few squares at a time, being careful not to get glue on your iron. Trim off excess and continue filling in until the entire piece of fabric is covered. Trim off all excess fabric around the outside and iron final piece one more time, making sure edges are adequately fused. From here on out, this will be referred to as your “cover fabric”. Center the notebook on the cover fabric. Measure the top and bottom until even. Add 1/4 of an inch to this number. In my case, the top and bottom measurements were 1/2 inch. Adding a 1/4 inch brings it to 3/4 inch. This is how far in you will sew your border straightstich. Sew a line 3/4 inch (or your own calculated measurement) in across the top and bottom of the cover. The reason for this line of stitching will become apparent in step 10. Step 5: Sew under sides of cover. Iron a 1/2-inch crease into both short sides of fabric. Secure the raw edge under with a straight stich 1/4 inch in from the edge. Center the notebook on the RIGHT side of the cover. Fold in flaps and measure both sides until they are even. In my case, this measurement is 5 1/2 inches. Pin the flap at the top and bottom and slide out the notebook. Step 7: Sew down the side flaps. Determine the top and bottom seam for the side flaps. Lay the notebook back on the cover. Measure the top and bottom, moving the notebook until it is centered and both measurements are the same. Note this measurement and SUBTRACT 1/8 of an inch. This is your seam allowance for sewing down the flaps. My measurement was 1/2 inch. Minus 1/8 and I have 3/8. Sew the flaps down with appropriate seam allowance, back stitching where the flap ends near the center. Step 8: Clip corners and turn cover right-side out. Step 9: Test fit the cover. Step 10: Press and sew in raw edges on top and bottom. Iron crisp edges and folds into the cover. Iron raw edges on top and bottom down and pin. With raw side DOWN, sew at least 3 inches of raw edge down, lining up stitches on your previously “seemingly useless but pretty” border line of straightstiches. Step 11: Refit the Notebook in the cover and your finished! Although I have included my measurements in this tutorial, in my experience, not all composition notebooks are the same! Measurements and fabric size may need to be adapted slightly for your notebook. If you would like to use your own fabric instead of making patchwork fabric, then start this tutorial at step #4. I would recommend interfacing lightweight cotton for a more substantial cover. Step 1: Cut out squares of fusible webbing. Since fabric in charm packs come in 5-inch x 5-inch pieces, I measure and draw a grid on my fusible webbing just a bit smaller at 4 7/8 inches x 4 7/8 inches. 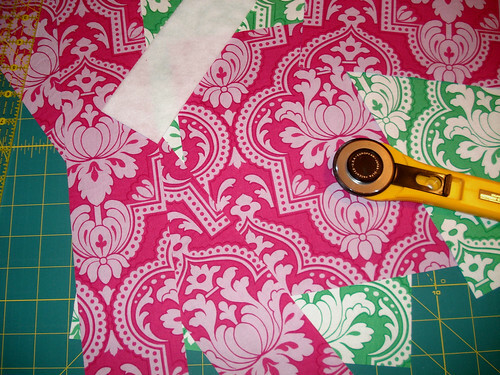 Cut out the fusible webbing squares with your paper-cutting scissors. The paper will dull your good sewing scissors. Place the fabric right side DOWN on the ironing board. Place the sticky side of the fusible webbing onto the back of the fabric with the paper side up. Iron on according to fusible webbing instructions (just a few seconds on medium heat in my case). Step 3: Peel away the paper backing. Make sure when the piece goes off the edge that you don’t fuse the fabric to the ironing board cover. Turn the paper over and trim the extra fabric off. Continue to fuse and trim and iron down the edges until the front of the card is covered. Notice how my peicing isn’t perfect? The decorative stitches will cover up some of these imperfections. Step 6: Sew decorative stitches onto the “seams”. I chose a gold thread to go with the fall colors. I like high-contrast threads as well that make the decorative stitches pop. My favorite stitch these days is the sewn-out zig-zag. Sewing through paper on a sewing machine will dull the needle. I keep a needle specifically for this purpose and put a sharp one back in when I go back to sewing fabric. Step 7: Edgestitch the card with a straight stitch. Step 8 (optional): Embelish with buttons, ribbon, etc. Step 9: Stick “quilt” to the front of card using double-sided tape. Faded Memories with blue button. Martha Negley’s Cupcake Fabric with little loop stitches. To the home sewer: I have been asked by several people if they may make this bag for sale. The answer is YES, you may! 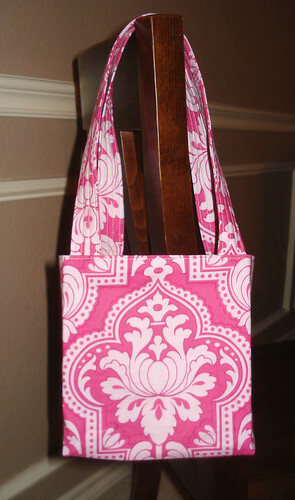 I maintain my copyright on the pattern (instructions and pictures), but please feel free to create this bag and sell it! In all measurements, width is listed first, followed by length. 2 fat quarters, although more fabric will be needed for centering a design. 1. Prepare fabric. Wash, dry and press all fabric. Fuse interfacing to WRONG sides of all fabric. 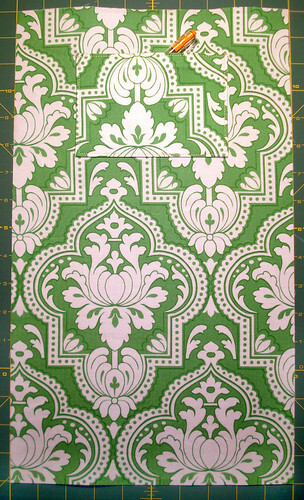 In above picture, pink fabric is for the exterior fabric and green is the interior fabric. 3. Make pocket. Fold pocket piece in half with RIGHT sides together so that it measures 6 ½” x 4 ¼” and secure with pins. Starting at one side of the fold, sew up one side, stopping ½” from the edge. Turn the pocket piece and sew across the top, leaving a 1 ½” opening at the top for turning. Sew to the next corner, stopping ½” from the edge. Turn the pocket piece and finish sewing the remaining side. Clip corners and turn the pocket right side out, pushing corners out with a narrow tool. Iron the pocket flat and select one side to be the top. Edgestitch with a 1/8″ seam allowance across the top of the pocket. 4. Attach pocket to the liner. Position the pocket on the liner piece 2 ¼” from both side edges and 1 ¾” from a top short edge. Secure pocket in place with pins. Attach the pocket to the liner by edgestitch with a 1/8″ seam allowance around the 2 sides and bottom of the pocket, backstitching at beginning and end for a secure hold. The pen is intended to show the position of the pocket. 5. Assemble bag liner. Fold liner in half RIGHT sides together and secure with pins. Sew up the 2 sides, leaving the top open. Snip open the corner seam as shown. Box corners by laying the side seam against the bottom of the bag. See this post for additional pictures and explanation on boxing corners. 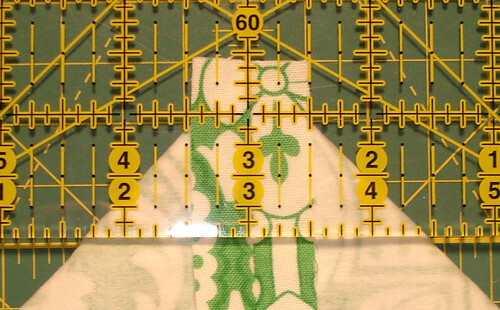 Measure 1½” from the top of the snipped seam using a ruler as shown. Mark a line perpendicular to the side seam and pin in place. Sew on this line, backstitching at the beginning and end. Note that a triangle is formed when boxing the corner this way. Trim this triangle off with pinking shears after sewing. Set aside. 6. Assemble bag exterior. 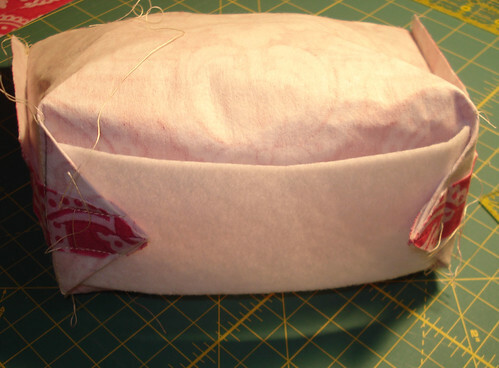 Sew exterior piece just as liner above (sewing up both sides and boxing corners but do not trim off the triangular pieces. Lay the stabilizer piece across the bottom of the bag and pin to the triangular pieces on the bottom of the bag exterior. Sew the interlining to the triangles. 7. Make the straps. Press in ½” on both long sides of the strap pieces. Fold strap in half and press again. Secure with pins. Edgestich along long open edge of straps. 8. Attach straps to liner. With the right side of the liner facing in, pin straps to inside of liner 1 ½” from the side seam as shown. Make sure the straps are hanging inside the bag toward the bottom. Turn the liner so that the right side of the fabric is facing out. Baste the straps in place with a ¼” seam. 9. Assemble the bag. Place the liner inside the exterior of the bag so that the right sides of the fabrics are facing each other, making sure that the straps are hanging down in between the 2 layers. Line up the side seams and pin in place. Pin around the top of the bag. Starting on the middle edge of a strap, sew across the strap and around the top of the bag, stopping just after the 4th strap, leaving an opening for turning between the straps. Backstitch at the beginning and end so that the stitches won’t unravel during turning. 10. Turn the bag. Carefully turn the bag right side out through the opening, pushing all the corners out. Push the lining into the exterior of the bag. 11. Finish the bag. Press around the top of the bag for a crisp edge, pressing fabric in ½” at the opening. Pin the opening closed. Edgestich with a 1/8″ seam along the top of the bag. 12. Press in the creases. Iron in creases along the bottom edges of the bag and up all four corners (from the bottom corner to the top edge) of the bag. You’re finished! Care. As with any fabric bag, you may periodically want to press creases back into the bag or press wrinkles out of the fabric.